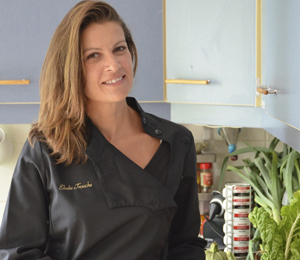 Elodie Trouche is a Holistic Chef and a graduate of The Natural Gourmet Institute for Health & Culinary Arts in New York City. She is a teacher and a consultant on Wholefoods cooking, as well as the owner of Trouche Catering. Her kitchen reflects her philosophy on eating consciously and cultivating an appreciation for nourishing the body. As a personal chef, Chef Elodie customize menus that are “Palate Specific” and helps you enhance your lifestyle by freeing you to enjoy quality time with your loved ones, or if single, providing you leisure time. As a time-crunched professional or family, she invites you to return home to the tantalizing aromas lingering in your spotless kitchen stocked with sumptuous and cost efficient meals in your refrigerator and freezer. So come along and escape from the kitchen and let Elodie Trouche’s Personal Chef Services nourish you.